GMP standards – Constant vigil of temperature and humidity controlled storage units are critical for industries engaged in manufacture of lifesaving vaccines and drugs. In 2014-2015, countries around the world began banning the import of pharmaceuticals from India because of the lack of compliance to WHO GMP standards. It is estimated that this caused the Indian market to lose around $1 billion US dollars. We are introducing an Industrial Internet of Things solution, RipplesIOT, to improve greatly the overall operational control bringing the much needed transparency in the system. RipplesIOT solutions integrate in real time to capture vital information to ensure complete track and trace of the high value medicines to ensure quality and visibility in supply chain logistics. This also ensures reduced cases of medicine theft and mishandling that would save millions to the manufacturer. The high autonomy devices and ready to use software ensures easy deployment and quick integration. 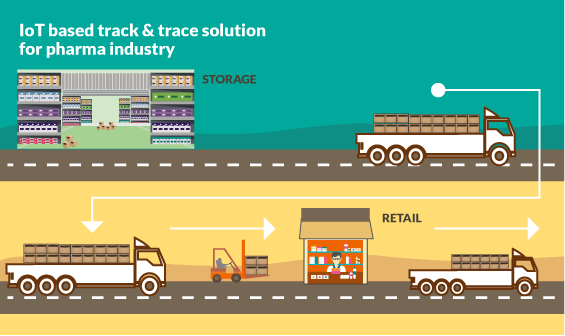 RipplesIOT solution for supply chain visibility comprises of deployment of long range, reusable tags on the containers and trucks carrying the vaccines from factory to warehouse and retail outlets across the country.